Of widespread occurence throughout England and Wales including the isles of Wight, Scilly, Lundy, Man and Anglesea, in the north and west most records are coastal, in the southeast there is an abundance from north Kent and East and West Sussex. In Scotland there are east coast records north to Aberdeen and a single west coast record from Ayr, it appears to be absent from the islands (Luff, 1998). This is an insect of dry, often sandy and open habitats; grassland, heaths, Calluna moorland, wasteland, arable land and coastal sand dunes although they also occur in gardens. Generally quoted as abundant (Luff, Lindroth) although less so in the north and Scotland. Found throughout the Watford area in a variety of habitats; during September 2006 many adults were found among piles of dry grass cuttings on the Radlett road playing fields while on the same day single specimens were found nearby under willow bark along the Colne riverbank. Numbers vary from year to year; following an autumn abundance during 2006 adults, either singly or in pairs, were found in grass tussock samples from across our area during February and March 2007. Similar sampling techniques (Berlese extraction) and frequency applied during the same period of 2008 failed to produce a single specimen. This species breeds in the spring and is diurnally active (Luff, 1998). 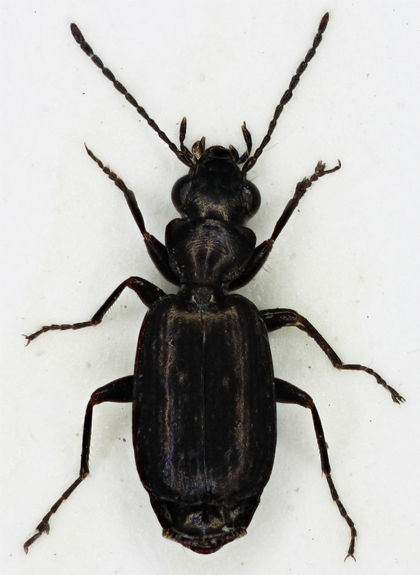 When first recording these small carabids many may seem very similar, mostly because of their size and dark colouration, but with a little experince members of Syntomus may be recognised in the field with a X10 lens. 3.1-3.8mm. (lindroth, 1974). 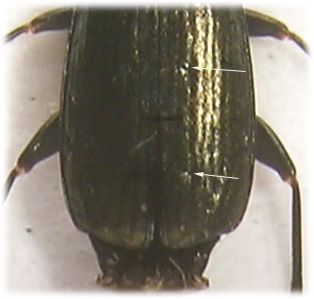 A small and flat species with proportionally large head and small pronotum, entirely black with distinct metallic lustre, usually brassy and most evident on elytra. Upper surface with dense and strong reticulate microsculpture, a little weaker on pronotum, clypeus and labrum. Head with temples strongly contracted behind large and prominent eyes, two setiferous punctures beside each eye and another inside antennal insertions. Maxillary palpi black or rufinistic apically, terminal segment well developed. Antennae entirely dark or with a basal segment lighter beneath, pubescent from fourth segment. Pronotum strongly bordered, broadest behind rounded front angles, strongly narrowed to very obtuse and weakly defined hind angles which are displaced before base. Weakly impressed inside hind angles but not distinctly foveate, with a central longitudinal furrow and oblique furrows behind the front margin forming a 'Y'. With a long, stout seta inside hind angles and inside lateral margin at widest point. Elytra entirely dark, without macula and not paler than forebody. Strongly bordered from near apex of scutellum to sutural angle, sides weakly curved or somewhat parallel, truncate and sinuate apically leaving terminal abdominal segment(s) visible from above. Striae weakly impressed but distinct, three foveate punctures within third stria, sometimes only two are distinct and a strong setiferous puncture near suture by apex of scutellum. Legs entirely dark, protibiae strongly notched inside near apex. Tarsi without bilobed segments. Claws dentate. Male with three faintly dilated pro-tarsal segments. Description taken from three Watford specimens examined at X40.